Speedcheckme is an ad-supported Internet speed checker that does not excel at its one obvious function. If it was superior to all other speed checkers on the market, it might be possible to overlook the downsides. The situation being as it is, however, we must classify Speedcheckme as adware and recommend immediate removal from your system upon discovery. Speedcheckme works identically to SpeedChecker, Ineedspeed, and TestSpeeder. Upon installation, it shows a speed checker in the bottom-right corner of your monitor. While it is able to evaluate your Internet speed, we find the quality of service to be lacking. It does excel at showing you commercial advertisements, however. They could take the form of pop-ups, shopping offers, or other forms of ads. These commercial disturbances are even quite attractive to the average computer user. This is because Speedcheckme also collects data about your browsing habits to be able to better sort through various ads it can show you. It chooses the ones that would interest you the most, based on what you look at on the Internet. These ads can be very annoying. It is not hard to see why we think that it is a splendid idea to remove Speedcheckme from your system. When you click a Speedcheckme advertisement, you get redirected to a third-party website and the developers of this application get paid. 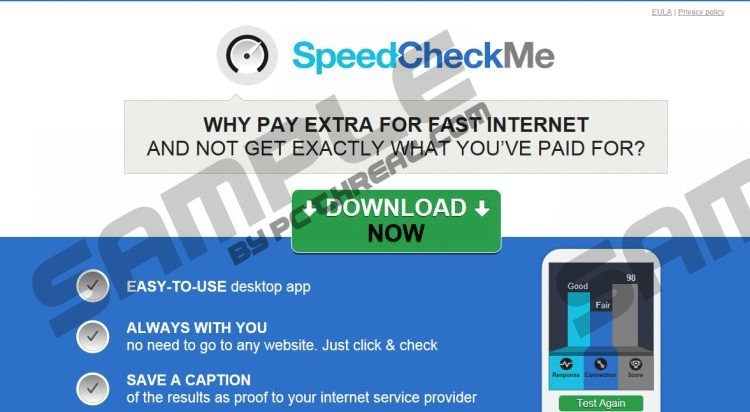 Some Speedcheckme partners’ websites are likely to contain threats to your system security, as Speedcheckme website claims that its developers are not responsible for the contents of its partners’ websites. With each person who visits these partner sites with Speedcheckme’s help, its developers get paid. This is called a pay-per-click agreement. This type of monetary reward for increased web-traffic is universally used to finance adware running costs and to make profit. We find it unfair that you take on danger and do all the work, while not getting your cut out of the deal. We would delete Speedcheckme immediately for this alone. You can remove Speedcheckme manually or automatically, using a professional and trustworthy spyware removal tool, like SpyHunter. It will scan your memory and registry, find any dangerous programs and remove all threats automatically. It is a more secure and simpler way to rid your system of threats, however, ultimately, it is your choice, so the instructions for manual Speedcheckme removal are included below. Click Start, go to Control Panel, and click Add or Remove Programs. Right-click Speedcheckme and click Remove. Select Speedcheckme and click Uninstall. Right-click the lower-left corner of your screen while in Desktop. Quick & tested solution for Speedcheckme removal.